Hungary’s foreign minister has branded his Luxembourg counterpart “an idiot” in a row over immigration. Peter Szijjarto, in an article published on the Hungarian government website, accused Jean Asselborn of wanting to flood Europe with migrants. It comes after Luxembourg’s Asselborn criticised Viktor Orban’s government in Hungary, calling him a dictator. He was giving an interview to German newspaper Der Tagesspiegel after Hungary passed laws clamping down on organisations that helped asylum seekers. Asselborn said it represented an “attitude [that] suits a dictator who believes that the drive to maintain power is more important than any political moral decency”. Szijjarto, responding to the criticism of Orban, said: “Jean Asselborn has crossed all possible boundaries with his latest statement. 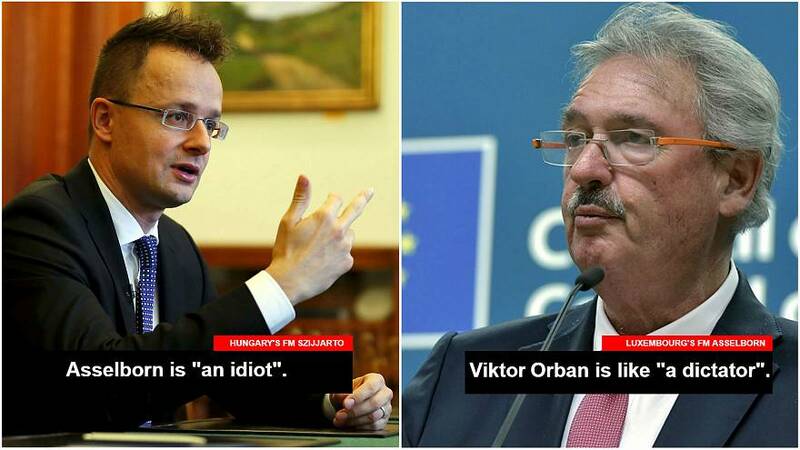 “Jean Asselborn is an idiot, but the Hungarians are not; the people of Hungary have no need for of the Luxembourgian foreign minister’s crazy ideas to know what’s good for them. Amnesty International said the new laws would make organisations that “support migration” in Hungary obtain a permit to operate. The same organisations would also have to pay a 25% tax if they received foreign funding for their pro-migration operations. Orban has been embroiled in an escalating "Stop Soros" feud with the 87-year-old philanthropist, waging a billboard and media campaign asserting that he would "settle millions from Africa and the Middle East". Soros has rejected the campaign against him as "distortions and lies" meant to create a false external enemy. Poland, Hungary and other ex-communist eastern member states of the EU have all pushed a strong anti-immigrant stance, even though the number of asylum seekers who want to stay in these countries are very few compared to western European countries. Germany received 5,235 first-time asylum applications in December 2017, compared with 120 in Hungary, according to latest figures from Eurostat.